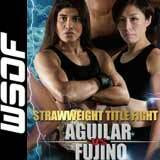 Review: 2014-06-21, fight not particularly good between Jessica Aguilar and Emi Fujino: it gets two stars. Jessica Aguilar entered this fight with a mma record of 17-4-0 (59% finishing rate) and she is ranked as the No.1 women’s strawweight in the world, she suffered her last defeat in 2010 when she faced Zoila Frausto Gurgel at Bellator 31, since then she has fought eight consecutive times winning the Wsof title in her last bout, against Alida Gray (=Aguilar vs Gray). Her opponent, Emi Fujino, has an official record of 13-7-0 (46% finishing rate) and she entered as the No.16 in the same weight class, she fought three times in 2013 beating Amber Brown and Hyo Kyung Song but then she lost to Mizuki Inoue. Aguilar vs Fujino is valid for the WSOF women’s strawweight title (Aguilar’s first defense); undercard of David Branch vs Jesse Taylor – WSOF 10. Watch the video and rate this fight!